Costa Rica is a haven for adventure lovers, thrill seekers, and romantics. When we visited earlier this month, we were burdened again and again by some information that, well meaning, is not entirely true. Here to debunk some of the most popular “advice” of Costa Rica. MYTH 1: You can’t drive the country alone. FACT: The country’s roads, though still largely created by boulders and rocks of many sizes, can be driven without hired help and you definitely don’t need a tour bus. A 2WD vehicle is not necessary if you are staying on paved roads. Please note that the roads to Volcan Arenal (Arenal Volcano), La Fortuna (city, and La Fortuna Waterfall) and the surrounding hotels are largely unpaved. The road from La Fortuna to Monteverde is also unpaved (even if you take the ferry across the lake, much of your travel is going to be on unpaved road. MYTH 2: It’s unsafe to drive at night because of thieves. FACT: The danger lies in the complete inability to see axle-breaking potholes in the road at dark. No street lights line the unpaved roads. Seldom you will have a fence between the road and the cliff, but rarely. Please don’t drive once the sun completely sets. MYTH 3: San Jose is like any other capital, easy to navigate. FACT: Wrong on so many levels. San Jose is rife with very narrow roads and two-lane roads that abruptly become one-lane. We got lost (several times) even with the Costa Rican GPS. MYTH 4: My iPhone GPS or Google GPS will navigate me through Costa Rica. FACT: Yes, the Costa Rican GPS is expensive, but I promise you that you will use it and you will love it. The Costa Rican GPS alerts you of school zones, dangerous bridges (often one-way), and reduced speeds. Google satellites are extremely dodgy in the mountains and the instructions are delayed by three to five seconds. This doesn’t sound like a lot on paper, but Costa Rica driving instructions involve a lot of “Turn right, then make a sharp left, then turn right again” in a second’s time. The lag from your standard GPS will prove frustrating at the very least. MYTH 5: Rental car insurance is a waste and I should get only the minimal coverage. FACT: The majority of domestic car insurance companies limit their liability on rentals abroad. Even if you call your insurance company and are advised otherwise, some information is bound to be omitted. We opted for the insurance that gave us ZERO liability; the agent literally said, “You can bring the car back in pieces, and no charge.” Yes, this almost tripled the cost of the rental car, but having that green light to be as rowdy on the rocky roads as we could be, well, was a treat. MYTH 6: Sodas are the cheapest place to stop and get food. FACT: Food prices in Costa Rica have tripled over the past three years. Formal restaurants will still be the bulk of eating expense, but the sodas we went to in the highlands cost us $6 for a heaping helping of chicken and rice. If you want to drink Costa Rican beer on the cheap, head to the closest supermercado, or market, where you can still pick up beers for less than $1 each. 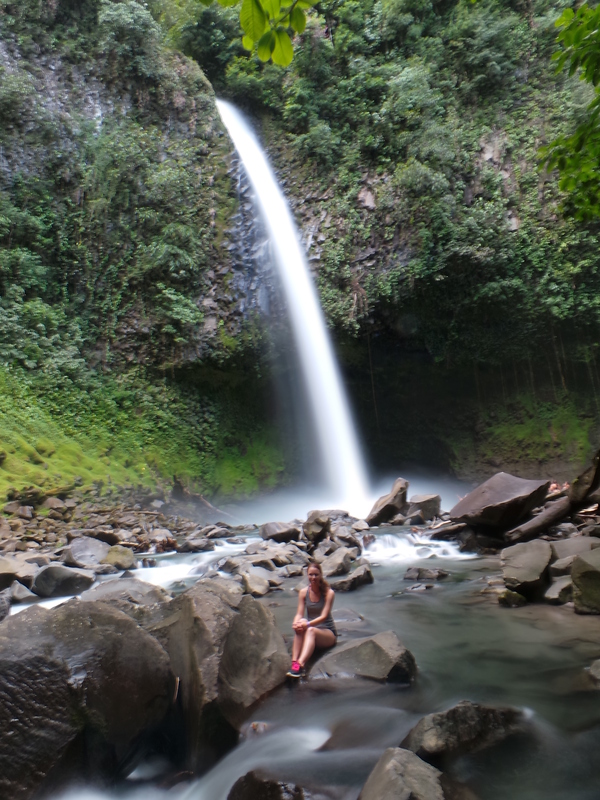 A trip to the mountains of Costa Rica is incomplete without a visit to La Fortuna Waterfall, and for good reason. It’s a beautiful sight. You can swim in front of it and get an awesome picture of yourself with the waterfall thundering behind you. The hiking trail is well traveled, though it’s much easier to walk down the hundreds of steps than it is to come back up. There’s landings at regular intervals to rest. In front of La Fortuna. The lifeguard watched me closely to make sure I did not climb over too many rocks. However, in the last few years tourism to Costa Rica has exploded. The well traveled tourist trail is getting even more, well, traveled. What once was a waterfall that one could spend uninterrupted hours at is now a lunch stop for tour companies operating in the Arenal region. This makes alone time with La Fortuna rather difficult. We arrived at 11am to find a few couples swimming at the base of the falls. In the next half hour, Desafio Tour Company and their group of 30-40 people arrived and tourists sprawled out over the rocks in front of the waterfall to eat lunch. Unless a person is sitting perfectly still, the long exposure shot of the waterfall (like the type we were trying to get, above) becomes completely distorted. There’s a lifeguard of sorts at the entrance to the waterfall now. You used to be able to swim behind the waterfall (a sublime experience) but this lifeguard does not permit that. In fact, if you get too close to the waterfall you get a whistle blown and a hand waving you back to shore. It takes the “unadulterated nature factor” away. 1) Make sure you are down to the falls before 10am. In order to do this, you’ll have to get your ticket to the waterfall by 9am (tickets are still $10 USD). 2) Carry a small backpack with drinking water, a light snack, flip flops/ water shoes, and a towel. 3) Wear your bathing suit. There are no stalls to change in. 4) Leave before the lunch crowd, which trickles in about 11:30am. (It pains me to say there’s a lunch crowd at a waterfall, but there is).